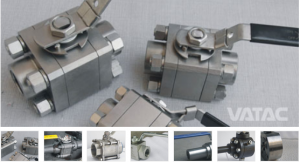 Ball valves, as the name implies, are stop valves that use a ball to stop or start the flow. The ball performs the same function as the disk in the globe valve. When the valve handle is operated to open the valve, the ball rotates to a point where the hole through the ball is in line with the valve body inlet and outlet. When the valve is shut, which requires only a 90-degree rotation of the handwheel or Wormgear for most valves, the ball is rotated so the hole is perpendicular to the flow openings of the valve body, and flow is stopped. Most ball valves are of the quick-acting type (requiring only a 90-degree turn to operate the valve either completely open or closed), but many are planetary gear operated. This type of gearing allows the use of a relatively small handwheel and operating force to operate a fairly large valve. The gearing does, however, increase the operating time for the valve. Some ball valves contain a swing check located within the ball to give the valve a check valve feature. Ball valves are normally found in the following systems aboard ship: seawater, sanitary, trim and drain, air, hydraulic, and oil transfer.